“Scrappy.” That’s a one-word summation of GigaGen’s approach to both the business and science of biotech. “When you’re a new company, you have to be scrappy and clever. When I founded GigaGen in 2011, I didn’t have a big war chest of money, so I had to find a way to be competitive. That’s central for survival,” says Dave Johnson, Ph.D., CEO of GigaGen. “Competitive” means “innovative” to Dr. Johnson. 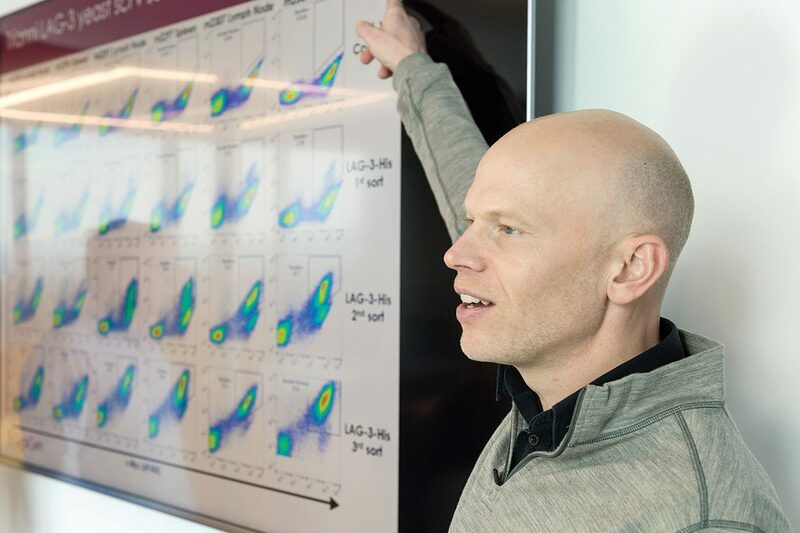 That drive to innovate resulted in a proprietary workflow called Surge, which he says not only interrogates every antibody in the immune system, but does it 10 times faster than other technologies. Surge technology, he says, is what differentiates GigaGen from the competition. The company has a new approach to studying the immune system, which is composed of millions of different cells displaying varied receptors. Such complexity makes it difficult for researchers to delve deeply into complex interactions, Dr. Johnson suggests. Combining proprietary microfluidics and genomics technologies lets GigaGen’s researchers delve deeply into the immune system to find rare, high-affinity antibodies that may lead to novel immune-based therapeutics. “Because we have a genomics background, we can go deep into the public datasets and analyze them differently, to discover new gene targets and then make high-quality antibodies and test them,” he adds. Using Surge for immuno-oncology, the company has generated a pipeline of thousands of antibody-drug combinations against 17 targets. For immuno-oncology, he says, “we take the T cells from tumors, and rather than just culture the primary cells and perform an analysis, we make them immortal. Then we make a library to study lymphocyte and tumor interactions. In a mouse model, you wouldn’t get much information, but with Surge, we can do this for millions of cells,” and thereby paint a more complete picture of what happens in the body. The genomics focus that forms the foundation of the company is both good and bad, he admits. “My [Ph.D.] advisor would say, ‘Experiment first, ask questions later.’ Although you do need to generate a lot of data, you also need a tight focus.” Otherwise, he says, a company can lose direction by having too many opportunities. It has to prioritize. Remaining true to the mission requires a lot of discipline. 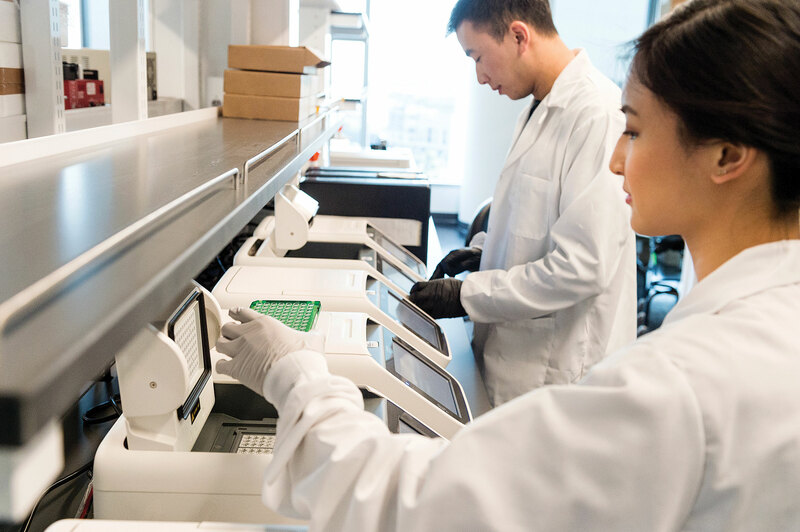 GigaGen’s massively parallel single-cell platform combines microfluidics, multiplex PCR, yeast single-chain variable fragment display, and fluorescence-activated cell sorting. In this image, GigaGen scientists are using PCR to physically link complete protein-coding sequences for massively parallel protein expression. The procedure is an alternative to nucleic acid barcoding, which computationally pairs T-cell receptor or antibody subunits. Notwithstanding its genomics roots, GigaGen takes a lean approach to development. “We’ve tended not to go forward without a partner,” Dr. Johnson says. That’s partly because of financial necessity and partly due to good business sense. Conversations in the quest to identify the right partners help GigaGen’s researchers refine their approach and more completely understand the market’s needs. He sees this as a form of market validation that indicates whether certain projects actually are worthy of going forward. When a partnership is formed and a project does advance, the milestones are already aligned tightly with market needs, so resources can be used more efficiently. “Think about this on a preclinical level,” Dr. Johnson continues. A company developing a drug in a particular area may do 20 different things and may spend $20 million before getting feedback. “It’s not always clear what the key studies will be, so many of those endeavors will be wasted if they’re not exactly what the potential partner needs. Therefore, talking with those potential partners helps you, as a company, identify the key parts of the data package needed to move the project forward,” saving time and money. “We did that in 2017 with Grifols,” he recalls, “performing the early, critical experiments that convinced executives that we had a viable path forward.” Grifols then partnered with GigaGen to scale the project. The need to run lean was particularly apparent in the company’s early days. “I founded the company in 2011, when I was in my mid-30s,” Dr. Johnson says. “In tech, you’re old if you’re 35,” he points out. In biotech, however, that’s not old enough. “I’d talk with investors, and they’d be interested. Then they’d ask how many drug development cycles I’d been through.” The answer signaled the end of many conversations. Dr. Johnson, however, remained determined. He turned to federal grants: “I wrote 110 grants in six years and won 16 of them. That 14% is an average rate of approval for an SBIR, and it generated enough funds to build the core company and begin partnering.” Ultimately, he generated $65 million in funding through grants and joint projects with Grifols, Novartis, and Merck. As the company matured, the challenge shifted from fundraising to staffing. “The economy is good here in San Francisco. You have firms with hundreds of millions of dollars, exciting technologies, and employees who know that,” he says. There’s a lot of competition for the right people. The lack of enough people with the right skill sets is a common whinge of the tech industry. Dr. Johnson sees through it and takes a different approach. Rather than holding out for candidates with the perfect mix of skills (like many technology companies), he and his team search for people with the right interests and potential and train them. “That’s good for their careers and for the company,” he declares. For Dr. Johnson, the next big thing is another specialty company. “It’s difficult to develop a company that’s active in antibodies, engineering, cell therapies, and immuno-oncology. At some point, you have to draw the line,” he admits. Drawing that line meant forming a new company, GigaMune, to pursue some of the cell therapy applications that are viable but not central to GigaGen’s mission. GigaMune, which recently signed a development deal with Massachusetts General Hospital to identify novel antitumor T-cell receptors for cell therapies targeting cancer, plans to take the same gritty, determined approach to fundraising as its parent company. GigaGen’s next moves, Dr. Johnson says, are to win another partner in an oncology deal next year and to advance some projects to the clinic in the next few years. He’s also beginning to think about an IPO, to take GigaGen’s scrappy, competitive edge to broader markets. Focus: GigaGen is a preclinical biotech company that develops antibody-based therapies to treat immune dysregulations. Its Surge technology interrogates every antibody in the immune system and identifies those antibodies presenting the greatest drug development potential.